The new 2018 Phoenix hoop design uses the same software and electronics as the original Hyperion hoop. (Existing Phoenix owners, see this page for more information on previous Phoenix models and upgrade options.) This means that the two hoops differ mostly in their battery configuration. The Hyperion uses a single, removable battery while the Phoenix uses a series of smaller, non-removable batteries spaced throughout the hoop. Both options have their advantages and disadvantages. A removable battery means that you never have to stop and wait for your hoop to recharge. When one battery dies, swapping it out takes only a few seconds. The Hyperion includes a 2-slot charger with car adapter that will charge two batteries in about an hour. The main disadvantage of the removable battery is that it creates a small gap - about an inch and a half - with no LEDs. For many patterns the gap is undetectable, but it becomes more noticeable with dense, bright patterns. The non-removable batteries in the Phoenix together have more than twice the capacity of a single removable battery, and allow for a completely gapless design. The batteries are spaced evenly around the hoop, which keeps the hoop perfectly balanced. The Hyperion's single battery means there's slightly more weight on one side of the hoop. 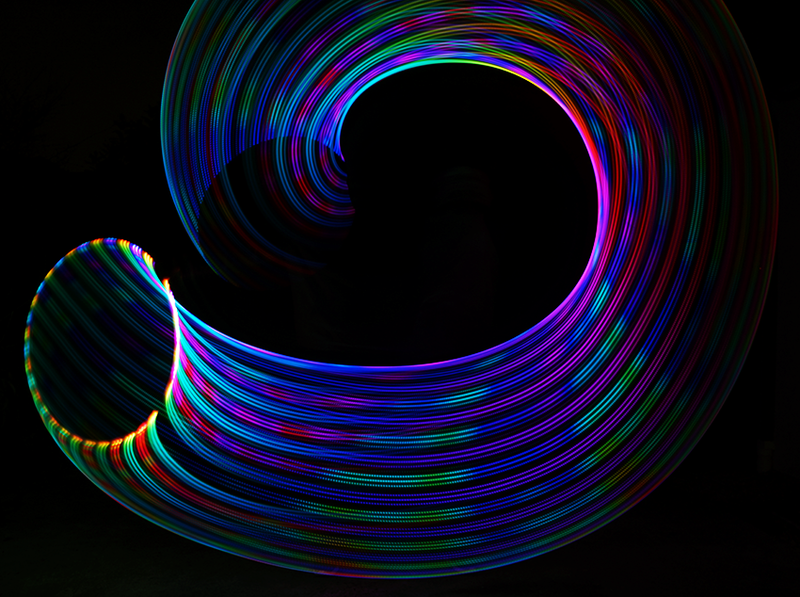 Whether the imbalance is noticeable depends on the hoop size and your hooping style. If you select the balancing option, counterweights are added to the hoop at two points to balance out the weight of the battery. This makes the total weight roughly equal to that of the Phoenix. Another consideration is that all rechargeable batteries will eventually wear out and lose capacity. How long this takes depends on how much you use them, how deeply they're discharged, and their storage temperature. Typically a life of hundreds of charge cycles can be expected if the batteries aren't abused. Removable batteries for the Hyperion are inexpensive and available all over the world, and can often be found in vape shops. We tell customers to expect to replace their batteries every year or two for best performance. Replacing the batteries in the Phoenix requires sending in the hoop for service. With multiple batteries to share the load, though, the Phoenix's batteries can be expected to last longer, and while they will lose some capacity over time they may well last the life of your hoop as long as they're kept charged regularly. Our hoops are available in sizes from 22" to 40" in half-inch increments. The Hyperion includes a free downsizing; the Phoenix does not. Both models can be resized, but due to the added complexity of the internal batteries, resizing the Phoenix costs slightly more. For some hoopers the choice will be easy; a Phoenix if you need a totally gapless hoop, or a Hyperion if you need the ability to last through back-to-back performances or a multi-day music festival without recharging. For others, it'll depend on your personal preferences and hooping style. Either way, you're getting the most advanced smart hoop available.